A baker browses through dozens of cake pans to plan confectionary creations of her wildest imagination. Meanwhile, a man chooses the perfect tie from more than 60 to wear to his graduation. 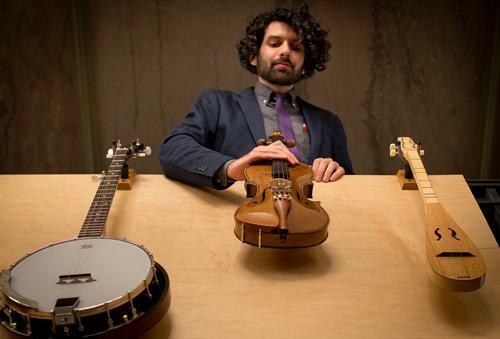 Elsewhere, a musician slated to play a wedding gig picks out an acoustic guitar from a batch of 25 other instruments. Although it might seem like these people are in a department store, they're actually at the Free Library! 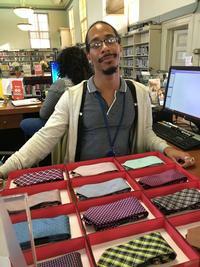 It’s well-known that a Free Library card comes with access to books, DVDs, and audiobooks—but cardholders can also check out neckties from Paschalville Library’s Tiebrary, cake pans from McPherson Square Library, and musical instruments from the Musical Instrument Collection at Parkway Central Library! These items can be borrowed for a lending period of three weeks, just like any other material. "At the Free Library, our core belief is access," says Perry Genovesi of the Music Department. "We have this place where you don’t have to have money to be able to use a resource or learn something." "It’s more than just ‘here’s a tie,’" says Niema Nelson, Digital Resource Specialist. "We’re dedicated to helping job seekers succeed." The Tiebrary is an integrated part of Paschalville’s Job Readiness Center, where customers can learn how to write a résumé, fill out a job application, prepare for an interview, or apply for a green card. As all three of these unique collections grow in selection and in capacity, librarians are planning programs around the collections and in conjunction with other departments. Nelson has already facilitated demonstrations on how to tie neckties, and Genovesi envisions a Musical Instrument Collection collaboration with the Culinary Literacy Center, combining food and sounds from world cultures. In the meantime, other borrowing ideas are brewing—like bird-watching backpacks and blood-pressure cuffs. Stay tuned! This story was originally featured in our Spring 2017 issue of Off the Shelf, a biannual publication with news and features from across the Free Library of Philadelphia system. Music Department librarian Perry Genovesi sets out a violin, just one of the many instruments that can be checked out from the MIC (Musical Instrument Collection). Library Assistant Omelio Alexander displays just some of the ties available for checkout at Paschalville Library. 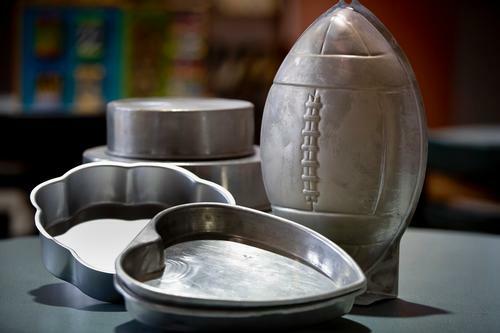 Football-, heart-, and flower-shaped cake pans are a few of the options at MacPherson Square Library.